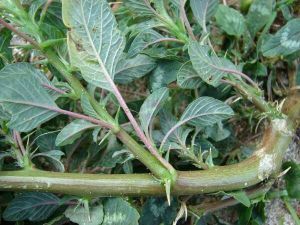 Amaranthus spinosus, commonly known as the spiny amaranth, prickly amaranth or thorny amaranth. It is native to the tropical Americas, but it is present on most continents as an introduced species and sometimes a noxious weed. It can be a serious weed of rice cultivation in Asia. Phat phak khom is a Thai stir-fried dish of the young shoots of the Amaranthus spinosus. This version is stir-fried with egg and minced pork. In Cambodia, it is called pti banlar and its ash was historically used as a grey dye for cloth. It had many other uses also, including as food.